I arrived in Madrid around 7am after flying from Guadalajara via Houston and Newark. I had already been traveling forever and still was a long way from my goal in Portugal. My train to Lisbon did not leave until about 9pm, so I checked my luggage at the train station and set out to explore Madrid. I didn't have any real goal for the day. I had an ancient Lonely Planet that said the Prado Museum would be closed that day - bad luck! So I tore out the map page and set out to see what I could find. 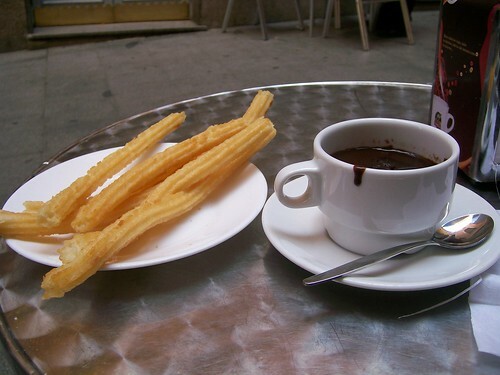 I had tried churros and hot chocolate in the states and thought it was only okay, but I had heard that it was wonderful in Madrid, so my first stop was at the Chocolateria San Gines. It was colder than I'd expected, so I was looking forward to the hot drink. But that's not what I was served. The churros, served hot from the grease, were thin and crispy on the outside and perfectly cooked in the middle - much better than the ones I'd had before that were thicker so the inside was often kind of mushy. But it was the chocolate that I'll never forget! This wasn't the drink I was expecting. It was more like super extra rich dark chocolate pudding right out of the pan when it has just cooled enough that you can stand to touch your tongue to it. It is not intended for drinking, but for spooning and dunking. And the combination of the two - heaven! The crispy churro coated with the thick rich chocolate was to die for! My luck continued - it turned out later that the Prado was open so I spent most of my day enjoying the wonderful paintings. And then I discovered another smaller museum across the street that was showing a collection of works of Albrecht Durer, my all-time favorite artist. What an unexpected treat! By this time, my legs were killing me and I was starving. I was very tempted to return to the chocolateria for dinner but I had feasted on art for lunch instead of food so I decided that would probably not be the best idea. I found a lovely plaza with a great little sidewalk restaurant where I spent a couple of hours over a wonderful dinner and more than one glass of red wine. After a long flight and a busy day, it was wonderful to just relax and watch the world go by until it was time to return to the train station.